From the connected farmhouses of New England to I.M. Pei's Media Lab, from "satisficing" to "form follows funding," from the evolution of bungalows to the invention of Santa Fe Style, from Low Road military surplus buildings to a High Road English classic like Chatsworththis is a far-ranging survey of unexplored essential territory. More than any other human artifacts, buildings improve with timeif they're allowed to. How Buildings Learn shows how to work with time rather than against it. Though honored as a writerwith the National Book Award for the Whole Earth Catalog, Eliot Montroll Award for The Media Lab, Golden Gadfly Award for his years as editor of CoEvolution QuarterlySteward Brand is primarily an inventor/designer. Trained as a biologist and army officer, he was an early multimedia artist. He has created a number of lasting institutions, including New Games Tournaments, the Hackers Conference, and The WELL, a bellwether computer conference system. He is co-founder of Global Business Network, a futurist research organization fostering "the art of the long view." "It's about time somebody wrote this book. This quirky, thoughtful volume, bursting with curiosity and intelligence, may make our everyday world more visible to more Americans. Architecture is too important to be left to architects alone." How Buildings Learn will irrevocably alter yor sense of place, space, and the artifacts that shape them." "An extremely attractive volume that will forever alter the way we respond to the buildings around us. We may also hope it will alter the way architects design buildings." How Buildings Learn is a hymn to entropy, a witty, heterodox book dedicated to kicking the stuffing out of the proposition that architecture is permanent and that buildings cannot adapt." "The book's diagnosis is clear and to the poiny, and its illustrations of how buildings change are both fascinating and instructive. 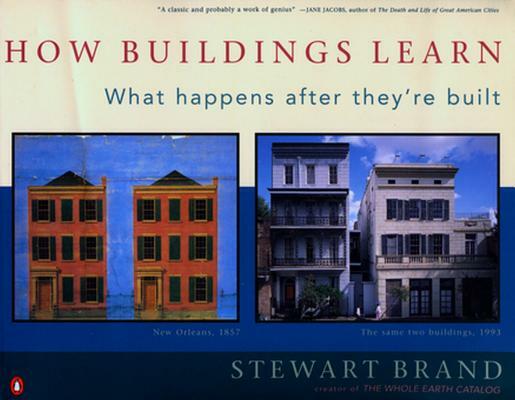 This is, in short, one of the rare books that every architect should read." No architecture students should complete their preliminary studies without reading it from cover to cover."